Although Kevin already delivered his very positive review of Doubt earlier this week, I wanted to run this brand new poster today to shed some more light on the film. At first I didn't like the trailer and didn't want to have anything to do with this film, but when I watched that trailer again on the big screen in front of Frost/Nixon earlier this week, I had a revelation. I finally understood why this could potentially be so damn good. Bear with me and just accept this last minute marketing push as a good thing, because I'm not trying to strike up any more negative buzz, but rather promote this as it expands throughout December. Thanks to Cinematical for debuting this final poster. Doubt is currently playing in limited theaters around the country with an expansion planned for Christmas Day, December 25th. Check out this poster below and read Kevin's review if you haven't already. Don't forget to let us know if you've already seen it or not! Doubt is both written and directed by John Patrick Shanley, who was written screenplays for Moonstruck, Alive, and Congo and directed only Joe Versus the Volcano previously. The film is based on the Pulitzer Prize-winning play of the same name as written and directed by John Patrick Shanley as well. 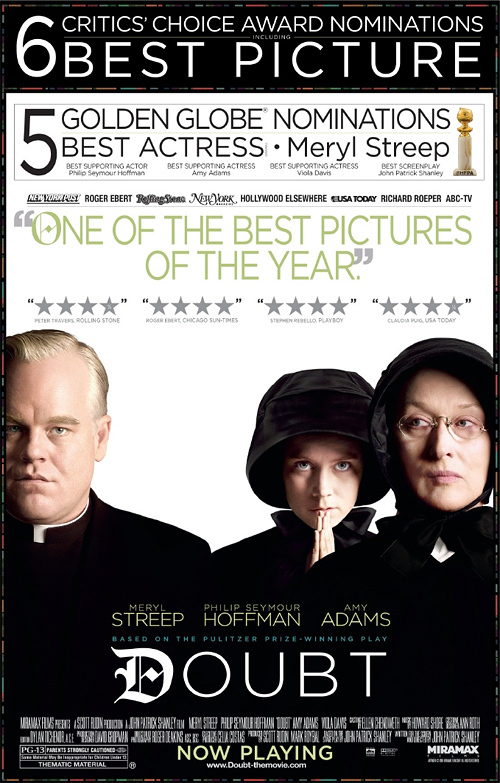 Miramax is debuting Doubt in limited theaters starting on December 12th this year. Will you see it? I'll admit that I wasn't impressed by the trailer but I figured it had something to do with the usual crappy advertising that films receive. But how could anyone not like the play. I thought both versions were brilliant. Amy Adams looks scary in that picture. I've been planning to see it since the first trailer, so it's just a question of when I'll be able to get to a theatre that's playing it. You know what I hate on movie posters? Names that don't coordinate with the picture. That just bothers me. But they're in order of billing, Streep being top. Oops, oh, you were making a joke, my bad. I agree with Andy... Screw billing, just put the names on their properly, they're all the same size anyway! That is a terrible poster for the movie. It is however, a great poster to show the accomplishments of Meryl Streep, which is completely pointless in this context. I am 100% with you Andy, it drives me f**king insane! ha, i didn't even notice the names... until I read Andy's comment! Now it is really bugging me! !